Welcome to the third and final part of my round up of this year’s Manchester Coffee Festival. In Part I, I took a look at the venue itself, and also my favourite coffee competition, the UK Cup Tasters’ Championship, won this year by Freda Yuan from Caravan. Then, in Part II, I focused on all the coffee roasters who were there in force this year. Today I’m going to finish things off with a look at the non-coffee stuff (equipment, reusable cups, milk, cake, tea…), although there’s also one coffee-related item that got missed out last week… Oops. Let’s start with a lovely piece of kit, the Conti 60th anniversary espresso machine. Inspired by Chris, the owner of Conti UK, this is a modern lever espresso machine that is being built to celebrate the 60th anniversary of Italian espresso machine manufacturers, Conti. Although not confirmed, the plan is to build just 60 of these machines. In many ways, this is a throwback to the early days of espresso: there are no gravimetrics, no volumetrics, just the skill of the barista. It is also designed to minimise the electronics, making it easy to maintain, minimising what can go wrong. I first saw the initial prototype at World of Coffee in Dublin earlier this year, when Dhan of Coffee Lab gave me a run through of its operation. However, this time I had Chris to talk me through it. The design is simple: there are separate steam and espresso boilers, the later fed by a one-bar external pump to provide pre-infusion to the group head. In operation, it’s very simple too: you pull down the lever, which compresses the spring and opens the chamber. You then wait for the grounds to become fully saturated before releasing the lever. This is where the spring comes into play, providing nine bar of pressure to force the water through the coffee grounds. As with all lever machines, the pressure profile isn’t constant through the shot: starting at nine bar, it drops through the shot as the spring releases. With the shots that Chris was pulling, he was ending the shot when the pressure fell to four bar, but that’s really up to the barista. Ending the shot, by the way, involves removing the cup from under the group head while the espresso is still extracting: there’s no off-switch here! Chris told me that it was also possible to fit seven- and five-bar springs instead of the nine-bar springs: it’s really down to what the barista wants. And that’s it. Clearly the machine won’t be for everyone, and this was only the second prototype, but I can see plenty of baristas being interested in it, plus it looks gorgeous (to me, at least). I’m wondering if sixty is going to be enough…? Moving on, there were a couple of reusable cup manufacturers at this year’s festival, all part of a wider recycling/reuse theme. At one end of the scale was Aussie giant, KeepCup, a company so successful that “KeepCup” is often synonymous with reusable cup. At the other end of the scale, British start-up Jody Leach was there with his Therma Cup. This double-walled, thermally-insulated cup is manufactured in the UK and is made of china, which pleases me no end. Initially I was a little sceptical and it does have its drawbacks, the main one being that it’s quite bulky (due to the double-wall construction). However, it still slips easily into my rucksack, although it often doesn’t quite make it under an espresso machine group head. Despite its bulk, its internal volume is a pleasing 8oz, the same as a KeepCup Brew. The big strength of the Therma Cup, and the one that Jody was demonstrating at the festival is that, as the name suggests, it keeps your drink warmer for longer. As I can attest, as much as I love my glass KeepCup, the glass gets very hot. While keeping the drink warm is rarely an issue for me (they don’t last long enough to cool down), it can sometimes be tricky to hold, whereas the Therma Cup is delightfully cool to the touch, even if you put near boiling water in it. The other concern I had was its (perceived) delicacy. Being made of china, I was afraid I might break it, but over the last six months I’ve given it a thorough road test, including taking it to the Grand Canyon and back, the Therma Cup has proved its robustness. These days, I’m perfectly happy slipping it into my rucksack when I go out and about. For more on the KeepCup, Therma Cup and other reusable cups, please see the Coffee Spot Guide to Reusable Cups. At this point, I was getting hungry, so after the gallery, let’s talk food. One of the best bits about going to the Manchester Coffee Festival is catching up with my friends at Cakesmiths. I don’t know why, but Cakesmiths seems to have adopted me, feeding me toasted banana bread for breakfast, and then various cakes at intervals throughout the day, although if I’m honest, the banana bread (and its cousin, the smashing pumpkin bread) can’t be beaten. Then, at the end of the festival, there’s usually a little something that finds its way into my bag, although this time around it was an entire tray-bake! You can find Cakesmiths cakes at coffee shops all over the country, although if you happen to be in Bristol, you can call in on Cakesmiths’ very own cafe, Bakesmiths. Another pleasure is catching up with Paul of Kokoa Collection. Kokoa Collection sells awesome single-origin hot chocolate and the parallels with the coffee industry are striking when it comes to sourcing. Last year, Paul went out to Haiti to visit the cocoa farms there and Kokoa Collection’s award-winning 75% Haiti dark hot chocolate is amazing. Even better, Paul (or the left luggage locker, as I know him) lets me keep my bags in his stand. Such a lovely man. New at this year’s festival was Oxenholm’s Lovingly Artisan, bakers of some fantastic sourdough bread. Fitting, you could find Lovingly Artisan next to fellow Cumbrians, Carvetii. I had a couple of samples of the bread and I absolutely loved it, including having one loaf as my lunch on Sunday, which was a life-saver. One of the festival’s strong points in previous years has been the street food. This year, however, stalls were rather thin on the ground, with just three traders in attendance. The downside of this was the large queues at each one, not helped by the stands being outside by the entrance. Fortunately, for once, it wasn’t raining in Manchester, but it was the coldest it’s been and this didn’t make quickly popping out for something to eat an easy option. On the first day, I picked the shortest queue, which was for Barnhouse Bistro, which, despite only having meat-based burgers, was happy to knock-up an impromptu cheese/salad sandwich for me. On the second day, facing with long queues at all three, and with a Cup Tasters semi-final to get back to, I ducked back inside and had the aforementioned loaf for lunch. After the gallery, I’ll be talking milk and tea. Let’s get the tea out of the way first. As much as I don’t like the stuff, I do like to see tea done properly, and one of the names I always look out for in coffee shops is Brew Tea Co, which has recently expanded its operations, moving from its old home in Liverpool to Manchester. Brew had a stand next to Cakesmiths so I popped in to say hello. New to Brew this year is its tea pot, which has taken the humble tea pot to new levels of sophistication. Designed for loose-leaf tea, this stylish teapot eliminates the need for a separate strainer, nor does it require you to put your tea into a brewing container (which limits the contact of the tea with the water). Instead it looks a little like a glass cafetiere, containing a fine filter in the lid which keeps the tea leaves in the pot while allowing the brewed tea out. Genius. Anyway, that’s more than enough time devoted to tea. Moving swiftly on, I caught up with the folks from Stephensons Diary, who I met for the first time at the festival last year. Stephensons is a milk processor with a difference: it can trace its milk back to an individual herd, all of which are free-range, each with its unique characteristics. By providing this sort of traceability, which matches the sort of traceability that the third-wave industry applies to its coffee beans, Stephensons is able to pay a premium to the farmers, vital considering how dairy farmers are struggling in the UK at the moment. Stephensons has had a good year, seeing a 25% growth in sales and spreading out from its base in Lancashire to include Cumbria and Manchester. It’s also been a good year for the cows, with mild weather and lots of rain, making for some excellent grass. This has meant that the cows can stay out for longer too. Like coffee, milk is a seasonal as well as a regional product. Milk from Lancaster should taste different from milk from, say, Sheffield, but, just as with commodity coffee, the milk industry has gone a long way to standardise everything, robbing the consumer of that natural variation. However, the likes of Stephensons and other producers around the country are slowing bringing that back, but they do need help from the coffee shops, who need to realise the importance of the provenance of milk in the same way that they realise the importance of the provenance of coffee. When done well, this can be a virtuous circle: just as customers enjoy the coffee and so buy the beans to use at home, Stephensons is finding that customers enjoy the milk too and then want to buy that was well, giving the coffee shop another potential source of revenue (although admittedly one with a considerably shorter shelf-life than coffee beans!). After the gallery I’ll leave you with my last activity of the festival, a coffee cupping. I normally avoid coffee cuppings, not deliberately by the way, it just seems to end up that way. However, I was determined, after the Cup Tasters competition, to attend just one cupping, ending up at the very last one on the second day at the festival. This was organised by OCN, which had four coffees from Panama and four from the Philippines. 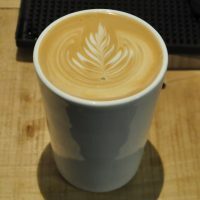 The latter were of particular interest to me after discovering Filipino speciality coffee for the first time this year when I went to Muni Coffee Co.
Cupping, for those who don’t know, is a formal method of preparing and tasting coffee so that you can get as close to the coffee’s underlying flavours as possible. First the coffee is ground and put into little bowls, then hot water is poured over the (rather coarse) grounds. These steep for five minutes, then the crust is broken with the back of a spoon. At this point, stick your nose into the bowl (but not the coffee!) and have a good sniff, taking in the coffee’s aroma. Next, any surface grounds are removed and you’re ready to taste. Technique is all-important and mine needs a lot of work! Taking a small amount of coffee in a spoon, the aim is to slurp it with a sharp intake of breath, the air mixing with the liquid, dispersing it more evenly around your mouth. You should be looking to taste the coffee at various temperatures since a coffee will often evolve in taste as it cools. Finally, if you don’t want to get over-caffeinated, don’t forget to spit the coffee out at the end rather than swallow it. The first thing I’ll say is that even with my limited palette, I could tell the difference between the Panama and Philippine coffees. The former were far more refined and fruiter, while the latter had less subtle, earthier tastes. The four coffees from Panama were all from the same farm, but grown at different altitudes, from 1,000m to 2,000m. I found that the higher altitude ones were sweeter, with an almost cinnamon scent, but I preferred the lower altitude ones as they had more body. The four coffees from the Philippines were all from the same farm, but processed in different ways. In contrast to the ones from Panama, I couldn’t really tell that much difference between them, although that might have more to do with my palette than anything else! However, despite my (lack of) palette, I found it fascinating and a great insight into how differences such as altitude can have an impact on taste. If you have a chance to attend a cupping (plenty of roasters and coffee shops now run free public cuppings) I do recommend attending one.